Business collaboration plays an important role in driving innovation, especially as today’s corporate environment becomes more and more competitive. Today’s leading companies all recognize that innovation is the key to success. In IBM’s recent CEO study, more than three quarters of the 765 chief executive officers queried cited collaboration and partnering as very important to their innovation efforts. OneDesk’s collaboration inbox is designed to facilitate organization and collaboration with your team members in real-time. 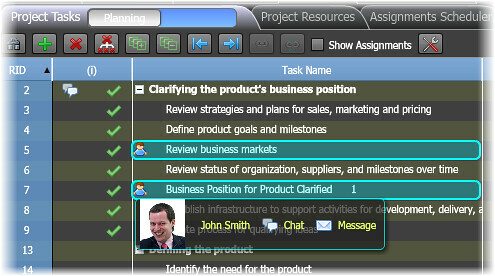 It allows you send and receive messages and chat with your team members. You can also stay updated and get notified when a change has been made to an item you choose to follow, whether it’s a blog, discussion, feedback, requirement, or project task. With OneDesk’s real-time indicators built into the item grids, users are always aware of what others are doing as they can collaborate on projects in real-time. OneDesk’s real-time collaborative editing capabilities allow you to see what items your team members are working on by showing their additions, deletions and edits immediately. Mousing over the colored indicators in the data grids allow you to see who is performing the edits. Discuss and elaborate ideas and feedback with the entire team, including partners and customers with OneDesk’s discussion forums. You can have internal discussions, start a one-on-one discussion with the customer, or open up a community discussion to get input from the whole customer base. OneDesk’s customer portal provides for easier business collaboration. It allows customers to submit feedback to your company, and allows you and your team to understand what they need. Through the customer portal, customers can also vote on feedback and discuss feedback amongst themselves. You can choose to create polls for customers to answer, as well as keep them updated on their feedback’s status. The customer portal helps enhance the customer experience, which helps innovate your business.